"Lights" out: Faced by a ban on labels such as "mild" and "light," cigarette makers have lightened package colors. In anticipation of a ban against using words such as "light" or "mild" on cigarette labels and ads, tobacco companies have lightened package colors to convey the same message, a move the American Lung Association and Rep. Henry Waxman, D-Calif., have attacked as disingenuous. The ban, part of the Family Smoking Prevention and Tobacco Control Act signed a year ago by President Obama, takes effect June 22. The act gave the Food and Drug Administration authority to regulate tobacco products. As an FDA guidance document notes, many smokers mistakenly believe that cigarettes labeled "light" or "mild" "cause fewer health problems" than others. As for the color changes, "this is a transparent attempt by the tobacco industry to evade the law and mislead consumers," Waxman said Friday. "The tobacco industry is masterful in its knowledge of consumer behavior and marketing," says Paul Billings, vice president for national policy at the lung association. David Howard of R.J. Reynolds, maker of Salem and other brands, says the "smoking experience," not safety, is "light" cigarettes' appeal. 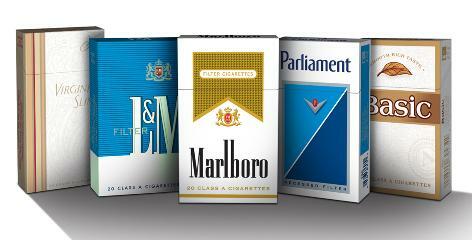 Different-colored packages ensure smokers can still get the taste they desire, Howard says. All Salem packages used to be the same shade of green, but now packages previously called "lights" are a lighter green and white, and "ultra lights" are a pale gray and white. "The bottom line is there is no safe cigarette," Howard says, "and that is certainly well-known among adult cigarette consumers." But, says research scientist Maansi Basal-Travers of the Roswell Park Cancer Institute in Buffalo, more than half of the more than 1,000 smokers she surveyed "believed that a high-tar or full-flavored cigarette is twice as likely to cause illness as a low-tar." And, she says, studies show that the lighter the package, be it food or cigarettes, the more healthful it seems. The FDA "should conduct a thorough science-based review and then ban any deceptive use of colors," Waxman said. Bonnie Halpern-Felsher, a pediatrics professor at the University of California-San Francisco, says "it's plausible that just the packaging difference is enough" to make young smokers think certain cigarettes are safer. FDA spokeswoman Kathleen Quinn said that though the ban covers "light," "low" and "mild" as of June 22, the FDA will evaluate other potential violations case by case.